If any of you own an Xbox One console, you must be familiar the troubles of keeping the batteries of your Xbox One controller charged at all times. You can always swap out these batteries for fresh ones but how many such AA battery packs do you plan to go through? Well, you may no longer need to worry about such battery woes as Insignia has made the perfect charging station to help you keep the Xbox controllers up and running. 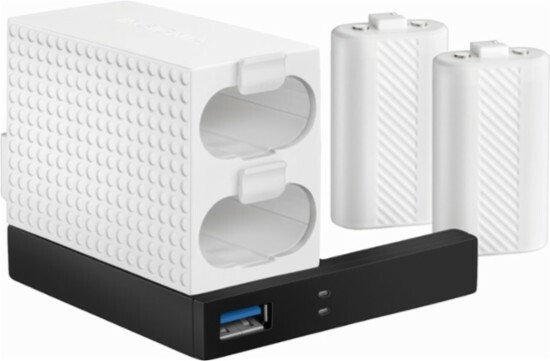 It has been designed for the Xbox One S, not the newest Xbox One X, and you can connect the charging station with the console’s USB port on the left to power it up. Yes, it’s that simple. Now the primary feature of this charging station that makes it perfect is its aesthetics. It’s donning the signature black and white theme of the Xbox One S and then it merges with the console with the perforations on the side of the dock. It looks as if its part of the console, even though it’s not designed or authorized by Microsoft. As you can see below, the Insignia charging station can hold two pairs of Xbox One controller batteries at one time. There are also charging indicators on the base of the dock, right next to the USB 3.0 port to plug a hard drive or charge your phone. The light is orange when the battery is charging but it turns white when the batteries have been topped off. This charging station is the most convenient alternative to everything else, be it another charging station or Microsoft’s Play & Charge cable. This dock plugs right into the console, matches its aesthetics, sits flush with it and offers all the functionality one might need to keep their Xbox gaming session going without any hiccups.